Composer David Bertrand plays the flute like an invitation: come hear this instrument for what it is, not for what you might believe it to be. It’s a welcoming approach that not only demonstrates something of the flute’s innate fine character and ability to blend with all other instruments, but it also rejects the idea that the instrument may only be played by certain people. Bertrand showcases this thesis—that there is room for everyone in jazz—in the compositions of his debut album, Palmyra & Other Places, with saxophonist Chris Bacas, drummer Carter Bales, guitarist Rafal Sarnecki, and bassist Rus Wimbish. We spoke in-depth over Skype, a day after Bertrand returned from a two-week trip home to Trinidad. The following interview was edited for clarity and concision. What was Trinidad’s jazz scene like when you were growing up? It’s strange how interconnected things are. I attended Queen’s Royal College, and without getting too deep into the socio-politics, the notion was that these were high secondary schools, “prestige” schools, and the quality of teachers and academic standards were broader than at other schools. It was all merit based, and I started there at 11, and that was significant because it was historically the highest school that many political thinkers, poets, artists, and writers attended. But it was also an Anglican prestige school; the difference was that the Catholic prestige schools would deemphasize artistic activities. The Anglican schools had a greater respect for the arts in general, but also for black expression. That same school is credited as being the cauldron that generated jazz in Trinidad in the 1970s. Culturally, Trinidad was, at that time, trying to figure itself out in the wake of the Black Power revolution in 1970. David Bertrand. Courtesy of the artist. As a youngster I watched TTT, Trinidad and Tobago Television. And there were these fillers that they would air, videos of live shows. So I would grow up watching Clive Zander, who is basically our response to McCoy Tyner. They were always on mid-afternoon and early evening. After He-Man, what comes on next? Oh, these guys! The optics were so powerful. It was always half-lit; the sound editing was beautiful. There was a predisposition to analog presence in the sound. It made sense for Trinidad, and there was always the resolution of silence at the end. It just kind of lingered. When you’re walking on the savannah, this dirt comes underfoot, this mist comes up. It doesn’t choke you, but it changes the resolution around you. So the lingering silence makes sense—it sounds like Trinidad. I wasn’t listening to it in an analytical way, but it felt really substantial. Aside from having a rhythmic and harmonic base that was coming from calypso, Trinidadian jazz in a way shunned the vocabulary of American jazz. So much of the jazz experience is listening, and then trying to play like what you’ve just heard. But that was discouraged: Don’t try to play like those Americans. Increasingly I felt like even though I could understand where it was coming from, it felt a little myopic. I feel like I have this strange relationship with Trinidadian jazz as it has developed, and I think it’s because I’m part of a generation that got additional information from TTT, books in the library, cable TV—which gave us BET, and which had one hour of jazz every 12 hours—and from the U.S. Embassy’s Information Resource Center, where you could read Downbeat Magazine and listen to entire performances on videocassette. Along these lines, what would you identify as some hallmarks of traditional and current Trinidadian music? You can’t explain Trini music without acknowledging how multicultural it is and how much the specifics of that can depend on where you grow up. Trinidad is a convergence of many things but the two greatest contributions are Afro-Trinidadian and Indo-Trinidadian communities. On the Afro side are West African drum cultures. And so much of that had to be practiced surreptitiously because there was religious persecution. Rhythmically, that evolved and eventually led to the creation of the steel band and its rhythmic sensibility. Calypso is connected to that. The closest parallel to me has been the samba sensibility in Brazil, where you have this deeply intricate polyrhythmic thing that can be abridged depending on how many people you have. Then there is the Indo-Trinidad perspective, and that was a slightly different experience, having been brought over with people who were indentured laborers. They were allowed to openly practice their beliefs, and you have so many expressions coming from that. So it was common to hear the tabla. Even if you weren’t in a specifically Indo-Trinidadian neighborhood, you knew their music. My hometown, Saint James, was synonymous with the tassa drumming tradition. You hear it during Hosay, which is an Islamic festival, and it’s this whole nocturnal celebration that’s based on celebrating this prince and princess and death. One figure dances the character of the moon, and it’s a really stout muscular guy who’s holding a moon on his shoulder. In tassa drumming, they’ll change meter and rhythmic patterns in a way that’s like watching a school of fish reacting to the current. As a kid, when Hosay was going on, minutes to midnight you’d see a big procession with these floating palaces and one solitary figure dancing, amazing drumming, and then it fades away, and then hundreds of people walking in silence behind that. And then you go to bed. The degree to which all that information comes into Trinidadian jazz depends on what family raised you and what relationships you were allowed to have. Because I was at Queen’s Royal College, I was around all these youngsters from across the island, so I was able to become comfortable with folks who didn’t look like me. One of my earliest musical memories is of a cat in second form named Devendra, who played tabla. He was from the eastern part of Trinidad, a Hindu community, and he would play the desktop like a demon, practicing. Nobody could beat Devendra. Where do those influences come through in Palmyra & Other Places? There is a tassa pattern that’s the first phrase of “Lexington 63.” Pa pa pa! You might think of Chick Corea but I was thinking of tassa drumming. There’s a line Nicolas Cage’s character says in Lords of War: in moments of extreme emotion, folks will always revert to their mother language. Every time I went up those stairs at the Lexington and 63 subway stop, I was always hearing tassa drumming in my head. In times of extreme stress, I still hear Saint James. “Storms & Mountains” is the closest thing to a ballad on the album. That piece felt very much like listening to the rapso group, 3canal. Rapso is less melodic than spoken, rhythmically, and you’re emphasizing the voice as opposed to actual tones. They’re melodic without dealing with harmonic content. The 3canal guys are able to convey the Trinidadian ability to be very self-aware but slightly nonchalant. So that was the opening phrase for “Storms & Mountains.” It’s always the first phrase. It won’t be that the entire melody speaks to a concept necessarily. It’s like writing—you get the first phrase and then things can flow. We don’t play ballads as slowly as you cats in the U.S. do. The protocol is that you don’t play fast, you play expressively. But in Trinidadian music, regardless of whether it’s from the African or the Indian side, you can hear all the sixteenth notes, you can hear all the frenetic activity. That leads to a different kind of energy and way to interact with the music. There’s one other tune that comes to mind, “South 1st,” that doesn’t even necessarily sound like it has any correlation to Trinidad. But at the very end where Chris Bacas and I are playing these lines behind Carter’s drum solo, that entire vamp was inspired by background music that would be played during the sports report on our national television’s news hour. They’d have completely separate music at the beginning and end of the sports report. It was only when I listened to the playback that I realized what I’d done. Are there other ways in which Trinidad influences your work? If I were not Trinidadian, I probably would not be playing the flute. But in Trinidad we talk about oppression as a fight dog. Either you bow down and acquiesce or you fight back. I’m playing the flute to fight. You fight me down, you fight my instrument down, and so the progress I make—it’ll be through merit. So much of the fight-down theme is parallel to people telling me what I could and could not be. Being a bright young black fellow from a lower-middle class family in Saint James, it was always: “You’re bright but know your limits. You can be a nice English teacher. Or a nice lawyer. Oh yes, be very respectful.” Don’t tell me what I can be. What drew you to the flute? I originally did not want to play it. I wanted to play tenor saxophone. I wanted to be somewhere between Joe Henderson and Joe Lovano. So I’m a kid. I want to play the saxophone. There are no saxophones. But I have this flute. As I continued I felt that the flute was a kindred spirit of the tenor sax. They can both be played so beautifully; they can allow you to be who you are. At the time, I was trying to come into my own, trying to figure out who I was trying to be, black and Trinidadian. What do you make of gendered expectations of the flute—or of any instrument? I’ve gotten that personally, because I’ve been told that the flute is a female instrument. I’ve owned the flutes I play almost twenty years. They are a part of me, an extension of me, my voice. I play them from my own perspective—I don’t even want to say a “male” perspective—I tell my story through it. Remember that great Duke Ellington quote: that’s the story of a man telling the truth about himself. It’s disappointing that the mandate we hear Duke articulating isn’t what we adhere to. I think it’s stupid. What makes a male sound? What makes a female sound? The prejudicial voice says women have a softer gentler lyrical sound, and men are forceful. But that is a misconception. I can only talk about my own perspective, and I think the idea of a masculine sound being forcible and grunting and aggressive is a misconception and prejudicial. It says men cannot be thoughtful, men cannot be gentle. I was a huge fan of the Justice League when I was growing up, and there is a point where Superman says, “I live in a world of cardboard and glass.” Here is someone who because of his unworldly strength has to navigate the world on tiptoes, but in that moment, oh my goodness, he shows that he’s a true man. Strength doesn’t have to be shown by punching through doors. Strength can be hugging Lois Lane and not crushing her. That to me is male energy. What does the flute allow you to say? I don’t have as wide a palate as someone who plays another wind instrument might. So I will never be the loudest voice in the room and I’ve learned that’s all right, if you’re in the company of people who are willing to listen to voices regardless of volume. You get to present something that is beautiful, clear and articulate. That’s part one. The flute contains the whole world, if you’re willing to listen. Besides being as nimble as it is, the sound itself blends with nearly everything. Other instruments might be louder, but the other sounds are able to comingle, it’s always positive. That’s another asset. When I play alongside another horn player, and they’re not accustomed to flute playing, they’ll say, “Oh, this sounds really good.” Yes, it should! Thank you for giving it a chance. The flute works with everything—it just needs to be given a chance to make that obvious. “Storms & Mountains”: David Bertrand: Flutes & Compositions Rafal Sarnecki: Guitar Rus Wimbish: Bass Carter Bales: Drums Filmed at the Scholes Street Studio, Brooklyn NY, October 2014 by Simon Yu. How do you approach tone and beauty in your playing? I should be using adjectives to answer you, but instead I’ll describe it as hearing specific voices, the way folk songs are sung in Trinidad. Strong, lots of overtones, no vibrato. The color of the voice doesn’t need to be embellished. You don’t have to be schmaltzy to convey emotion. Getting rid of vibrato was something I did immediately. Vibrato is such an essential part of classical flute playing, and I thought, “I don’t want to sound like that.” It isn’t taken seriously in the jazz setting. Flute is very weak at the bottom but becomes increasingly present the higher up you go. But the higher up you go, the sound becomes brittle. So the goal is making the register as full as possible at the bottom and have the upper registers mirror that. That evenness came naturally to me and I worked on it with different teachers. Who are your flautist role models? One is the late Joe Farrell, the saxophonist and flutist, who had an amazing run with Chick Corea. If I did a PhD thesis, it would be on how the flute surreptitiously contributed to the jazz sax tradition. Joe Farrell was of that generation where he had to play a saxophone, so he played tenor as his public main thing. But he also played alto. He was a really big early influence. So much so that I now play soprano saxophone also, because he did it in a way where the flute’s aesthetic wasn’t subsumed. Another is Kent Jordan, who was the son of Kidd Jordan, from New Orleans. He was originally a classical player and then increasingly found himself playing jazz. You have these amazing albums in the 90s and early 2000s where he’s playing with both Marsalis brothers and several with Kevin Eubanks. It’s very obvious that he’s the cornerstone, and it felt like he was applying John Coltrane’s vocabulary on the flute. For me it was like, “Wait a minute. Coltrane, saxophone. Coltrane vocabulary, flute.” He connected everything. There’s a third figure, he’s Swedish, Anders Bostrom. I ran him down for years, but there were no interviews. But he came over to study at the Berklee College of Music at that same period where you had Chris Cheek and Mark Turner and all these folks who would go on to be the New York tenor cats. And he was part of this. When he’s playing with Maria Schneider, you don’t realize there’s flute until it’s not there. When you think about the broader picture of jazz in America, how do you see international contributions at work? My childhood was deeply shaped by Marvel comics, and one of the creative areas they would explore is parallel realities. What if in this universe mutants weren’t persecuted? What if Peter Parker was a sociopath? All these different alternative perspectives. That’s how it is with jazz. This music, this deep, beautiful, ever-changing music is constantly shaped and reshaped by people. It is not a force on its own. We get to now see disparate expressions because people are coming at it from different angles. There’s this collective free-domain pool, but depending on where you’re coming from you might pick different combinations. One of the amazing things I witnessed at Queens College in New York were these ridiculously amazing pianists in the program. They were all female and they were mostly from Korea, and they were all ridiculous, every last one. I wanted to play with every one of them. What was interesting to me was they had all had this classical piano thing starting from when they were very young. But then the players they gravitated to were all post-modern jazz pianists who had a classical piano background. Herbie Hancock, Keith Jarrett, Chick Corea. It was natural to those students. And they could play that stuff like it was nothing. It seemed to me that the message was: Play more black. The idiosyncrasies, the beautiful things that were already there in the students’ playing, I heard less of. They became entirely different musicians. In jazz, we need to allow people to come as they are. Space needs to be made for them and they need to be allowed to find their own way. David Bertrand (1977) is a New York-based composer and multi-instrumentalist from the Saint James district of Port of Spain, Trinidad and Tobago. As a child, he played the trombone and French horn, before taking up the flute, his main instrument, when he was 16. Bertrand attended the University of West Indies, where he earned a degree in literature, and played jazz festivals throughout the Caribbean Islands, while also working as a secondary school English teacher. Bertrand moved to New York City in 2009 to attend the Aaron Copland School of Music at Queens College. 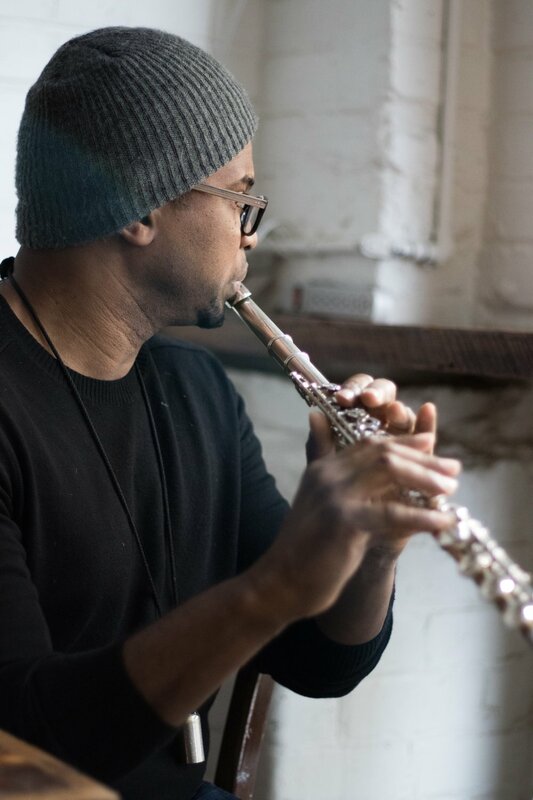 He now composes and plays frequently throughout New York at ShapeShifter Lab, Cornelia Street Café, and elsewhere, and works as a music educator. His debut album, Palmyra & Other Places, was released last year; he released his second album, Songs For An Empty Room, with pianist Julia Chen in August 2018. Whitney Curry Wimbish is an American writer and reporter in Scotland. Her interviews, essays, and journalism have appeared in The Baffler, BOMB magazine online, The Cambodia Daily, The Financial Times, Guernica, and elsewhere. Her fiction has appeared in MIROnline. Banner image courtesy of David Bertrand.